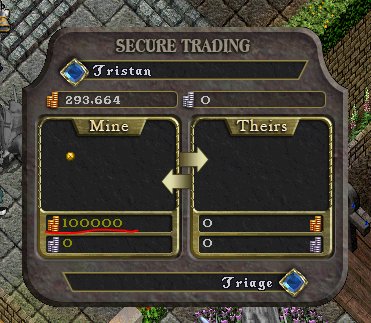 Discussion in 'New Player Questions' started by tr1age, Oct 28, 2018. Things on this list may change or be modified and will be updated accordingly. As well more will be added to the list as they come to mind or we add them. Power Scrolls do NOT need consumed in order. This reduces the grind. Enhanced guild system is implemented. Old guildstones still available from gold sink vendor in West Brit. Skill gain is quick so you get more time to adventure in the world and less time macroing a skill up for a more organic experience. Your Health is always 30 % more than OSI standards. So if you have 100 str normally you would have 100 health. But on UOAlive you have 125. This benefits PvE reduce one hits and allow you to last longer in battles. The enhanced client works for updated graphics as well as Orion, Razor Enhanced, and UOSteam. Secondary Skills DO NOT count toward skillcap. We are 100% OSI accurtate with all expansions and worlds enabled. All worlds are PvP Opt In. This means you can participate in guild wars and arena battles but cannot loot or kill unsuspecting players. You can insure most important items that are not cursed so if you die they do not fall to your corpse and will be with you upon resurrection. If you do lose a body and cannot get to it in time, you can use a corpse collector for a fee in Britain or Luna to have it brought to you. Bodies take 30 minutes to decay instead of 15. All weapons and armor should show a rarity underneath the name. Loot's sell value to vendors scales with the rarity; a [Rare] Longsword will sell for more than a [Common] one. House decay timers are 90 days. This means after 90 days of not refreshing a home it will fall and all items can be taken from the ground. If you have a home in the Luna vendor area, you will need to be actively playing the account or the house will be removed after 30 days. This only applies to Luna due to it's high priority vendor spots. Salvage Bags are available for sale from Provisioners. Scribes can create Spellbooks and Necromancy Spellbooks, as well as Necromancy scrolls with modifiers. There's a sawmill that will cut logs into boards for you. You can purchase a Bod Box from the gold sink vendor that will fill a Large Bod for you automatically with the needed smalls. All bods still need to be filled with the items. But it skips the step of hunting for all the rare bods. Dungeon chests show the level of the chest in its name. In addition to the normal levels 1-4, there is also a level 5 dungeon treasure chest that requires 95 Lockpicking to open. Treasure maps currently use the era-accurate positioning system, but drop the enhanced loot introduced in a later publish. There are Special stones near Brit West Bank. They have Sovereigns which can be bought with Gold and used on the UOstore. Or you can use Kudos which are rewarded for in game time. There are no donation stones as this is a donation free server. The skill title shown on your paperdoll will also be shown on hover of your character. Left click character to control titles. [organizeme command will, well, organize you. Buying and selling when overweight will cause gold or items to be placed directly in your bank instead of falling to your feet. 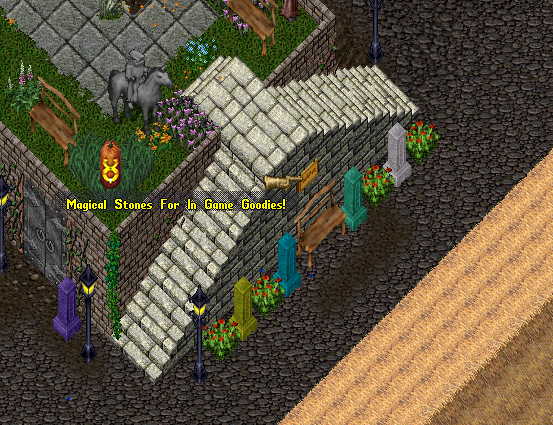 Non-young players can still finish quests in Haven. Young player status ends at 450 total skill points (up from normal). Runebook use cooldown reduced to 1 second from 7. Using an equipped Skinning Knife on a corpse will automatically cut and loot any hides the corpse may drop. Male characters can ride unicorns too. Increased amount of reagents that vendors stock. Skinning knife puts leather in bag. Gold Vendor sell Trapped Pouches with 30 charges. There are special trash barrels and bags available near Brit West Bank. These generate special currency used for certain rewards. Stealth is automatically checked and re-checked when walking while hidden. You can gain Spellweaing bonuses without needing other players at the arcane circle in Britain. 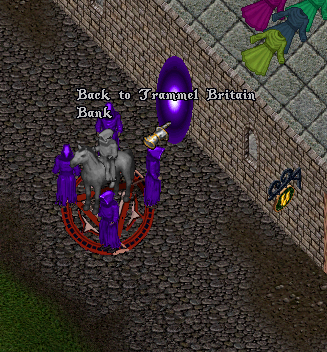 A gate has opened in Trammel Britain Bank that will bring you to the Arcanist Circle in Fel to get a spellweaving stone without needing other players. There is a gate back on the other side.